Bac Kan (VNA) - The Bac Kan cultural village festival 2017 has been held at the provincial cultural centre. The two-day festival, which ends on August 2, is organised by the province’s steering committee and themed “all citizens unite to build a cultural life”. It aims to popularise the state policy on creating a space for all quintessential cultural villages in the area. It will give groups a chance to meet, exchange and study each other’s experiences, allowing them to honour the outstanding faces in the movement; consolidate the achievements, and develop the culture and the Vietnamese people. 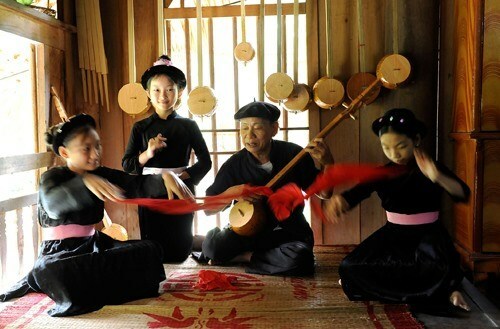 “The main content of the festival include the introduction of specific cultural beauties and outstanding faces and families of the villages, praising the reservation and promotion of typical cultural values of the country and the preclusion of social evils, superstition and unsound customs, as well as building the new countryside,” said Dinh Quang Tuyen, Chairman of Bac Kan city’s People’s Committee.